Romieki Glass has been providing high-quality San Francisco glass repair since we opened our doors in 1976. Every day, we strive to provide you with friendly service and completely scratch free glass. 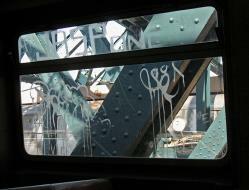 Graffiti vandals target storefront glass in all urban areas today. Scratches and acid etched graffiti have to be removed professionally. Rather than replace glass at hundreds or thousands of dollars, Romieki Glass will restore your glass to its original condition at a fraction of the replacement cost. THE SECRET OF OUR SUCCESS Lots of companies remove scratches but leave distortion in the glass. At Romieki Glass, we remove all scratches, shallow or deep and save you hundreds of dollars by avoiding glass replacement. Glass restoration and repair are more than just words…it’s what we do. We only hire the best people who share our passion for clean and scratch free glass. That way, you know you’re being helped by people who know their stuff. "Remove all Glass Graffiti, Repair all Glass Scratches." We Work Saturdays on appointment.